Carnelian and copper/bronze necklace or belt. With 42 long bicone carnelian beads, 72 spherical bronze beads, 6 bronze spacer beads, 2 half moon shaped bronze terminals, 2 hollow cylindrical bronze terminals. Hoard No. 2, DK Area, Room 1, House 1, Trench E.
Dimensions: carnelian beads range from 8.22 cm to 12.4 cm length, 0.9 cm max dia. 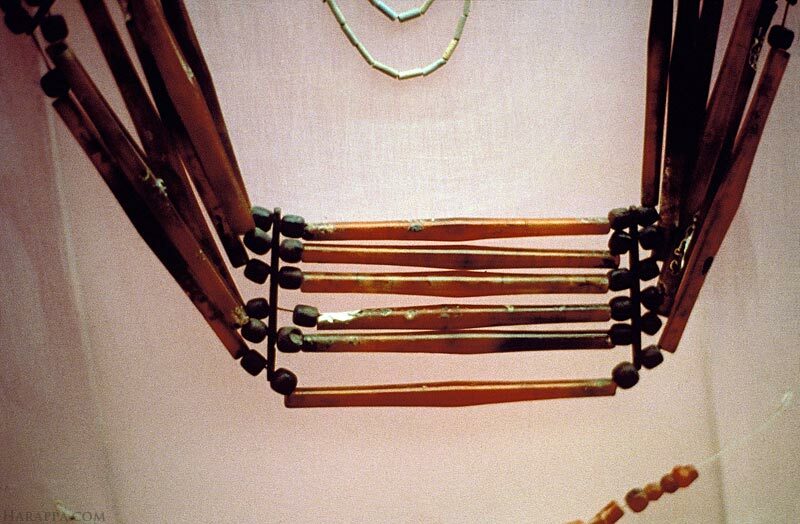 ; bronze beads c. .86 cm length, .85 cm dia. ; bronze spacer beads 0.2 cm length, 0.63 cm width, 6.2 cm height; bronze moon shaped terminal 3.9 cm length, 0.8 cm thickness, 6.1 cm height; bronze hollow terminal, 2.39 cm length, 1.0 cm max dia.